2015, what a time to be alive - not only do we have weightless and natural toned foundations but we now have waterproof foundation. Yes really, MAC have taken the wheel and reinvented it with MAC Pro Longwear Nourishing Waterproof Foundation. Something so simple but very much needed, especially in humid and wet environments. 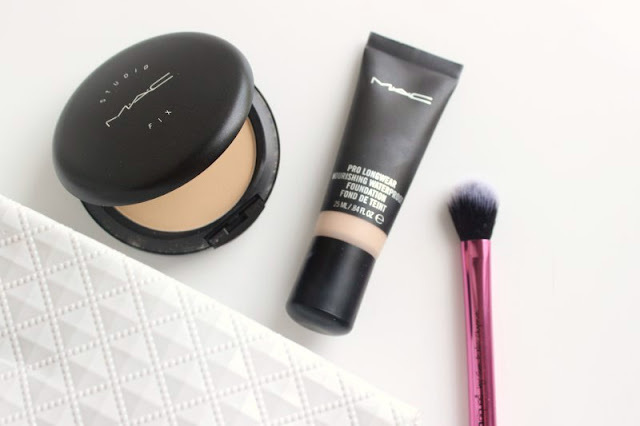 If you are struggling with foundation staying in place, MAC Pro Longwear Nourishing Waterproof Foundation could be just what you are looking for. A quick note on the packaging and shade range : as you can see MAC Pro Longwear Nourishing Waterproof Foundation comes presented within a somewhat small but plastic, squeeze style tube. It is easy to use (no pump required), simply gently squeeze to dispense the foundation and apply. The thick texture of the foundation is not prone to spilling nor leaking from the tube despite my often over zealous grip at times. As with most MAC formulations the shade range within the MAC Pro Longwear Nourishing Waterproof Foundation line is fairly vast; 16 shades in total ranging from light to deep, with cool, warm and neutral undertones. In my experience this particularly foundation runs a little light so you may want to order/try one shade up for a more fitting colour match. Let's forget the waterproof claim for a moment, MAC Pro Longwear Nourishing Waterproof Foundation is a light weight, almost gel based texture that is a dream to apply. Yes it settles to a satin almost matte finish, unlike other foundations of this type it is neither drying nor heavy on the skin, rather it is hydrating, creamy and comfortable to wear. It is quite a "wet" foundation meaning that it does take a little while to fully set and settle onto the skin - the good news is that this gives you a little while longer to blend and apply. The coverage is medium to full, it covers scarring, redness and blemishes with ease and builds with ease - it works just as well with fingers as it does a brush. I liken it a lot to Estee Lauder Double Wear Foundation both in finish and in terms of wear, the main difference is MAC Pro Longwear Nourishing Waterproof Foundation is far more comfortable to wear and won't cling to dry areas. Yes MAC Pro Longwear Nourishing Waterproof Foundation does take a little longer than normal to set but once it does, it does not budge - not in the rain, not under the stress of oily skin or humidity and rather wonderfully it does not transfer onto clothing. Is it fully waterproof? No, not really - it will not survive countless laps of a pool but then again who wears foundation while swimming? It will however remain intact during sunny spells, if caught in a rain storm and does not give way to sweat or oil - it really is an acne/oily skinned gal's dream base and yet as it is not at all drying even those with dry complexions can enjoy it. I can't quite believe I'm saying this but MAC Pro Longwear Nourishing Waterproof Foundation really is a 10 out of 10: it covers well, wears beautifully, is comfortable to wear and can handle even the sweatiest and oiliest of days. Your make up bag needs this. MAC Pro Longwear Nourishing Waterproof Foundation £25.50/25ml via Debenhams - link. This sounds amazing, really need to try out some more base products from MAC. I'm always a bit nervous because I think the last foundation I tried from them broke me out. Hopefully it was just a one off product because this sounds perfect for holidays abroad! Oooh this sounds amazing, role on pay day when I can check this out! Now this sounds phenomenal! As someone who lives in a humid climate, this foundation sounds like the best thing every for our 36-40C summers! I really like the sound of this product. I have tried MAC foundations before and liked them, however I never really went back to them. I am definitely going to visit a MAC store and pick this up. Will definitely check out this foundation! I have never got round to trying a mac foundation but, this one seems perfect in so many ways. Lovely post. This sounds like a great all round foundation- must look into it! This foundation sounds so good. Must go and try it out. Love the sound of the foundation, I hate products that just melt off!!! This is one that I need to try. It sounds so good! Love reading your reviews! I haven't tried Estee Lauder Double Wear despite hearing a lot of good things about it as I often get dry patches, but this sounds like it might be a perfect alternative for me. This sounds incredible! Added to the wish list. Oh Adrienne why do you do this to me.. I need! I love double wear but find it clings to a couple of dry spots so if this doesn't... It will be mine!! This sounds great! I cant wait to grab a tube and see how it fairs on my oily/sensitive skin. I've never used MAC - I'm very loyal to my Estee Lauder Double Wear! However this does sound like a great investment. I've never had a good experience with mac foundations. I feel like they settle into every fine line and wrinkle and make me look cakey. That being said...this review certainly makes me want to go to the MAC store and try this foundation out! It sounds like it could be the mac foundation for me!